A newly published Apple patent shows that the tech giant may be working on 3D mapping technology that has the potential to make augmented reality a more immersive experience. The patent, originally shared by prolific patent purveyors Patently Apple, shows a device that works by shining light through a transparent substrate that alters the light into a ‘structured light’ pattern. This pattern can then be detected by a sensor, allowing the device to gauge the distance and shape of the physical structures that are in front of it. This means that apps which currently use a phone's camera to ‘place’ digital items in the real world on your screen would be able to realistically show what they'd look like in the three dimensional plane. At present, augmented reality elements sit on top of whatever is on the screen, regardless of if they are supposed to be behind them in the real world. Apple is currently throwing itself headfirst into the world of AR, with its development of the ARKit, the developer kit for creating augmented reality experience. While the rumors are still coming in about Apple developing its own pair of AR glasses, one of the strongest things that Apple has going for it with its AR is that being able to use an iPhone or iPad means that people won't have to invest in new tech in order to be able to get their hands on an augmented experience. What is also quite exciting is the use of a hand as the image of the 3D element being captured in the patent. 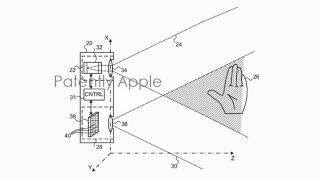 Apple devices having 3D mapping technology could mean that its AR efforts will be controllable using just your hands. Of course, Microsoft’s HoloLens already uses gestural controls, but the controls are in the world of ‘pinch for yes’ rather than ‘hold the digital object in your hand and rotate it’. While there’s no guarantee that Apple is working on making that exact thing happen, the technology described in the patent would make it possible. The patent was originally filed in 2013, and is but one of many Apple patents that we have seen involving 3D mapping, which suggests the Cupertino based company has been thinking long and hard about how to solve this problem. As it’s just a patent application, there’s no guarantee that this tech will ever see the light of day. However, given the amount of noise Apple is currently making in the world of AR, we wouldn’t be surprised if this tech or something similar started showing up in devices pretty soon.